MADRID, 30 May, 2018 – Mirada, a leading provider of products and services for Digital TV operators and broadcasters is excited to announce the launch of their brand new apps to provide their Iris multiscreen technology on even more devices to empower operators with the ultimate viewing experience across all major platforms. 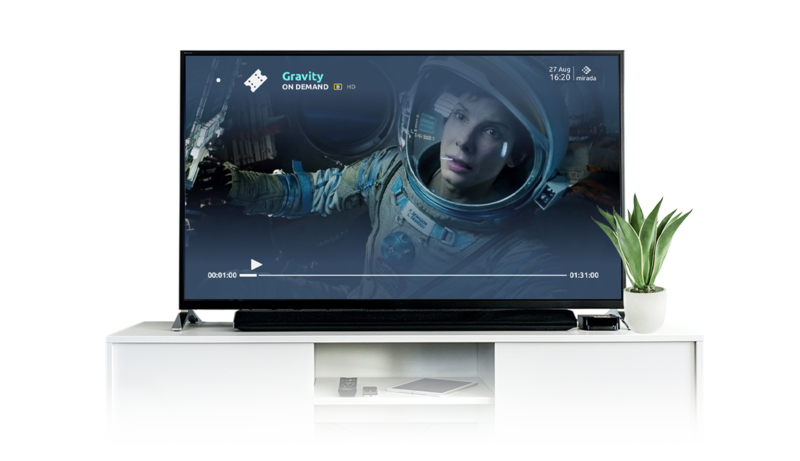 Mirada’s Iris multiscreen solution, which has served some of the biggest names in the pay TV world, allows customers to watch live, catch-up and on-demand content anytime and anywhere across set-top boxes, smartphones, tablets and laptops. Now with Mirada’s brand new apps, operators can provide their valuable content, along with all the cutting-edge features of Iris, across LG and Samsung Smart TVs, Android TV-based Smart TVs such as Panasonic, Philips, Sharp and Sony, Android TV streaming devices, Apple TV and Chromecast. Mirada developed these apps to offer a future-proof solution for operators who are looking to satisfy subscribers’ new preference to watch content on connected TVs (Smart TVs or via media streaming devices). By providing their service to subscribers not only anytime and anywhere, but also across these highly popular platforms, operators are making their content more accessible and therefore more likely to be consumed, which will extend the potential of their customer base and put them ahead of competitors. Operators will also benefit from reduced hardware costs as well as the potential for the ongoing rollout of new, advanced features to enhance their service while satisfying ever-changing customer expectations. The new apps come with Mirada’s attractive and intuitive Inspire UI, meaning operators can deliver live, and on-demand content with the ultimate viewing experience, regardless of the preferred platform or device of their subscribers. Similarly, the apps will also include all of the same, cutting-edge features of the Iris multiscreen solution including start-over, session transfer, content discovery tools and Cloud DVR, all powered by Mirada’s powerful back-end, Iris SDP. Mirada will be unveiling their brand new apps for Smart TVs and media streaming devices at Stand 4C4-01 at Broadcast Asia in Singapore this June, before the first commercial launch with an operator in the Americas later this year. For more information about Mirada’s products please click here, or to book a demo with Mirada at Broadcast Asia, please contact us.